Discussion in 'Birthing, Weaning, and Raising Young Goats' started by Goat Whisperer, Jan 31, 2019. Short story the kids were a tangled mess, two kids were trying to come at once. It was a tough one. Raina is doing great though. Congrats on a good save! I hope you guys are doing okay. I understand the spent part I hope by the time I crawled out from under my rock that was very similar to yours that your story would be complete. I will updated on my thread Mine included a 3 a.m. vet visit. Going through pics and sorting and with the latest 19 kids born last week I don't know where the time has gone. Next week will be our last doe for April. Then 1 in May and 1 in June. Here are some of my fav of some of the Nigerians. 1st round... this lil girl I LOVVVVVVVVVVE! I just get a kick out of her, she has so much moxi! This one was overexposed but I still love it. This 3 shot series is too funny. She was a prancing, then she stops for a pose, then looks back like "did ya get that?" AlleysChicks, HomeOnTheRange, SA Farm and 7 others like this. 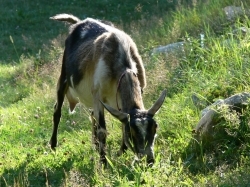 Ruth's buckling- he was braving the tall grass. Ruth's buck (left) and Clovers smaller buckling (right) amazing the size difference. Clovers buckling is more "normal size" lol. We all love this guy! He is getting spoiled. AlleysChicks, HomeOnTheRange, SA Farm and 6 others like this. They are all soooo cute!! They are so cute, how do you refrain from cuddling them all day? misfitmorgan and SA Farm like this.